This is not your typical classroom training program where you sit and take notes with dozens of other students and implement what you learn when you get home. From the time you step on the property until the time you leave you will be optimizing and publicizing your business listing with the assistance of a professional Local Search Marketing Expert in a beautiful outdoor tropical environment. Before you return home, everything that needs to be done to start generating new business on Google, Yahoo, Bing and a dozen other highly searched sites, will be done … and you won’t have to pay silly monthly fees to anyone to keep the business flowing. Yes, you can hire someone to do this for you, but is that what you really want? If you turn this task over to someone who is not intimately involved with your business, the results will be lackluster and you’ll never understand why? Don’t pay someone month after month for poor results when you can accomplish everything that needs to be done in less than eight hours. Before you leave Maui, you will understand how local search marketing works and how to use your knowledge to dominate your competition, because you will have done it while you’re here. By the time you get home, you’ll know more about Local Search Marketing than 99% of the people who call themselves Internet Marketers, and you’ll have the experience to prove it. Check with your family to see which program is most convenient for them and check with your accountant to see which program will allow you to write-off the greatest portion of your trip. If you’re coming to Maui with your business partner, he or she can participate in the program at no additional charge. Again, check with your accountant to see if they will be able to write off a portion of their trip including air fare, lodging, transportation, food, etc. To start, we’re not like other SEO or Internet Marketing companies. VizOnTheNet is a Local Search Marketing research and training company. And, even though we practice all forms of Internet marketing in our own business, run the Internet Marketing Association of Hawaii www.IMAHawaii.com and host the largest Internet Marketing website for Professionals on the Planet www.RecognizedExpert.com, we’ve chosen to focus our attention on the most powerful form of Internet marketing for local business owners … Local Search Marketing. 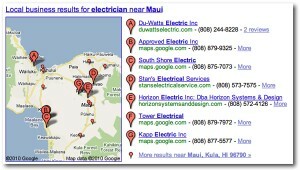 Local Search Marketing is what we do 24/7. We eat, drink and sleep this stuff so we can help you fully optimize and publicize your business on the Internet while you’re with us here on Maui.